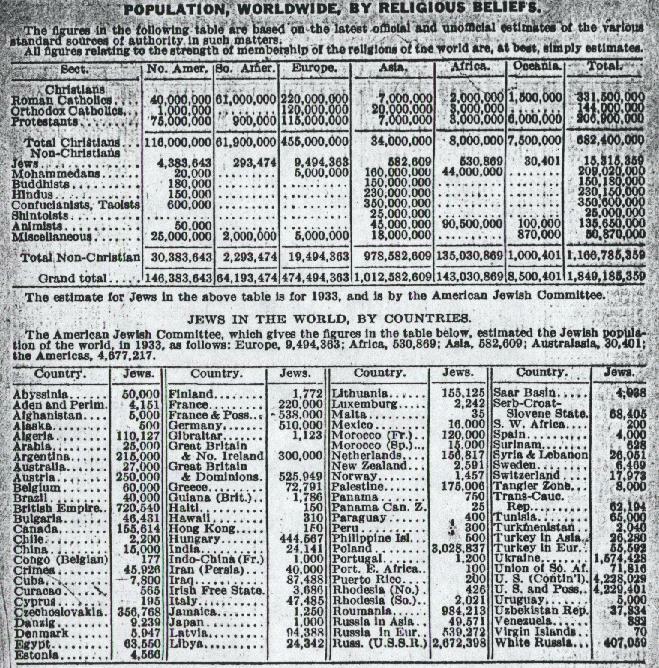 For over a century, the Jewish World Almanac has been widely regarded as the most authentic source for the world’s Jewish population numbers. Academics all over the world, including the editors of the Encyclopedia Britannica, used to rely on the accuracy of those numbers. Here is what the World Alamanacs of 1933 and 1948 had to say about the world population of Jews. NOTE – I GUESS THEY WOULD CALL IT ‘CHUTZPAH’, TO PUBLICLY USE THE SAME BIG LIE TWICE WITHIN THE SPAN OF TWENTY OR SO YEARS. The Jews have a documented history of fabricating alleged “genocides” of their people, and specifically a “holocaust of 6 million.” For example, an October 31, 1919 article in The American Hebrew journal entitled “The Crucifixion of Jews Must Stop!” warned of the impending mass murder and starvation of “six million” Jews in Eastern Europe, specifically using the term “holocaust” to describe the alleged situation. JEWS ALLEGED A “HOLOCAUST” OF “6 MILLION” JEWS IN ROMANIA, POLAND AND UKRAINE IN 1919 AT END OF WWI !!! NEW YORK TIMES REPORTS THAT RUSSIA’S “6,000,000 JEWS” WERE “FACING EXTERMINATION BY MASSACRE” IN 1921! 1919 NEW YORK TIMES ARTICLE: “6,000,000 JEWS” IN UKRAINE AND POLAND ARE “GOING TO BE COMPLETELY EXTERMINATED”!! The September 8, 1919 edition of the New York Times ran an article entilted “Ukrainian Jews Aim To Stop Pogroms” that alleges that “6,000,000” jews in the Ukraine and Poland are “in peril”, and “have received notice through action and by word that they are going to be completely exterminated”!See PDF of the article archived on the New York Times website HERE. – From the March 25, 1906 edition of The New York Times…archived here. Full article in PDF here. STARTLING reports of the condition and future of Russia’s 6,000,000 Jews were made on March 12 in Berlin to the annual meeting of the Central Jewish Relief League of Germany by Dr. Paul Nathan, a well-known Berlin publicist, who has returned from an extensive trip through Russia as the special emissary of Jewish philanthropists in England, America, and Germany, to arrange for distribution of the relief fund of $1,500,000 raised after the massacres last Autumn. Dr. Nathan paints a horrifying picture of the plight and prospects of his coreligionists, and forecasts at any hour renewed massacres exceeding in extent and terror all that have gone before. He left St. Petersburg with the firm conviction that the Russian Government’s studied policy for the “solution” of the Jewish question is systematic and murderous extermination. And why was Russia “persecuting” the jews in 1906 you might wonder? Well, the article cites the “paranoid”, “antisemitic” belief by the Russian authorities of a jewish plot/conspiracy to overthrow the government of the Russian Czar and establish a “jewish empire”. Hmmmmm. Well look what happened in 1917. Turns out this belief wasn’t so “crazy” after all. Furthermore, the article notes that the reporter to the Central Jewish Relief League of Germany made “an appeal to the Jewish money powers of the world to arrest Russia’s career as a borrower.” The “Jewish money powers of the world” have sufficient power to wage war on a nation by preventing it from being able to borrow money? And yet we’re told it’s just another “anti-semitic canard” that the jews dominate and control the world financial/banking industy. Interesting. Archived at The New York Times website here. Article is archived by google News HERE. EARLY HOLOHOAX TALE – 64 MILLION JEWISH CHILDREN WRAPPED IN SCROLLS AND BURNED BY THE ROMANS IN 2ND CENTURY A.D. THE ‘HOLOCAUST OF THE BULLETS’ ?